Boy, oh boy! It sure can be inconvenient when your day is ruined by an unexpected leap back in time. Do you ever fear waking up with your family in a prehistoric jungle that is just full of hungry dinosaurs? 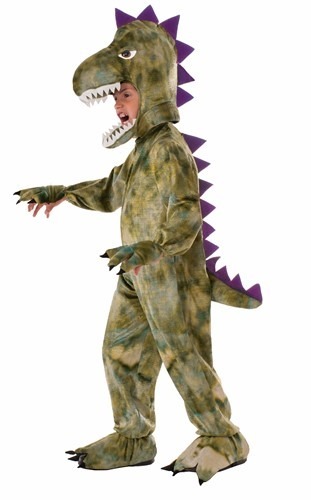 Well if you want to ensure your kiddo’s safety, you’ll want to grab him this Child Dinosaur Costume. That way he’ll blend in with the large, scaly predators and maybe even eventually be accepted as one of their own! Alright… maybe randomly being transported back in time isn’t something that you worry about on a constant basis. Maybe instead you’re hoping to find an awesome and fun costume for your youngster to run around in this Halloween. Well, there is no need to look any further. This Dinosaur Costume is as fun and awesome as one can get! It has menacing white chompers made from felt, as well as pointy purple spikes that go up the head and down the tail. You won’t know whether to describe your kiddo as adorable or ferocious once he’s stomping around town in this primeval costume. Give your little one a truly Jurassic experience this Halloween when you surprise him with this dino jumpsuit. Take a look at the rest of our dinosaur and caveman-themed costumes and then have the whole family walk around the neighborhood to give everyone a blast to the past. So whether you need costume ideas for the up-coming Halloween or a backup plan in case one of those unexpected quantum leaps occurs, this Child Dinosaur Costume is a great place to start for your little one!